I just made whipped body butter with two easy to find ingredients! If you've ever made cake frosting or chocolate ganache, you've got all the skills you need to make your own whipped body butter. But even if you have no baking experience, you should find this pretty easy to make. I love my homemade body butter! small wide mouthed jar(s) with lid, preferably glass. Select jars with the understanding that the ingredients will be more massive/voluminous once whipped. 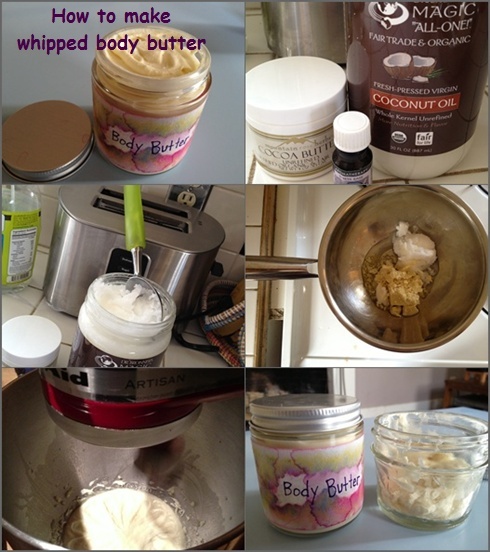 How to make whipped body butter. Melt the measured out oils together in a double boiler. If you don't have a double boiler (I don't), you can create one by simmering water in a sauce pan, then covering it with a metal or glass bowl that fits comfortably atop it. You wanna make sure the bowl is not touching the water. (If it is, pour out some water). Basically, you're using the heat from the rising steam to melt the oils together. Whip the cooled mixture on high. At this point, you can add some essential oils. It shouldn't take long before you get whipped butter. Yesterday was my first time making body butter and I am totally pleased with the results! The body butter is light, easy to use, and feels superdecadent on my skin. I decided not to add any essential oils since it already smells delicious. My boyfriend says it smells like a Mounds bar, which I guess makes sense because it's basically chocolate and coconut. Another awesome thing about this concoction is the price. I used Dr. Bronner's Virgin Coconut Oil, a 30 oz jar of which is on sale at the Providence Waterman Whole Foods for just $13.99! (Today is the last day of the sale, so drop in if you can.) At that awesome price, the 4 oz I used were just $1.87. The cocoa butter is from Mountain Rose Herbs. Since it was my first time ordering from them, I tried a small jar for $4.75. I used 2 oz of it in this recipe for $2.38. (I would've saved more had I purchased a larger container and I plan to do so in the future.) The jars were re-used so that's free. So we're at $4.25 and rounding up for shipping fees and tax (not sure I paid any but just in case), it couldn't have been any more than $5, even if I had added essential oils. Whoa! $5 for almost 8oz of organic, fair trade body butter. Yes!!!! I like supporting small, local businesses that make yummy handmade products, but I also enjoy exploring my creativity and making my own stuff too. Kinda like how I cook at home and dine in restaurants sometimes too. I'm thrilled to have this budget-friendly trick (or is it treat?) under my belt! I look forward to experimenting with making body butters from other oils and ratios once this batch runs out. I wanna send love to my friend Liz at Raganella, who introduced to me the crazy notion that you can make luscious natural body care products in your own kitchen. Also wanna send love to Annie B. Bond for her recipe (found in Better Basics for the Home) and Rawmazing for their homemade body butter blog post which filled the gaps in the aforementioned recipe. Have you made a body butter before? If so, what's your favorite recipe? And if you haven't, would you try this or do you prefer to buy body care products? Who makes your favorite body butter? Olivia Lane Lovejoy is a Green Living Educator trained at The Institute for Integrative Nutrition. Anyways I made a whipped shea butter mix. I might give yours a try in the near future. Thanks Maggi. I totally want to try making one with shea butter soon. I read that it has less of a scent that cocoa butter, which should make combining it with essential oils fun. O my gosh! this butter looks so yummy...lol. (I won't eat it), but my skin will surly do lol. Two of my favorite butters: coconut and cocoa! I visited your blog last week. I am totally going to try your recipe too! I love the look of your body butter. That is so yummy indeed. I'm excited to try this. Thanks! Are you a part of Uncommon Scents? I see they sell Badger stuff. I love those balms! I am totally going to try making some bootleg badger sleep balm here soon!